Buzzluck Casino was launched in 2004 and was one of the first casinos to go with the RTG casino software. When Buzzluck Casino was first launched they promised to revolutionise the online casino industry, now a little less than a year from that date we decided to review Buzzluck extensively and see for ourselves how they have lived up to that goal. For those of you that are looking for the most beautiful casino website I definitely do not recommend you visit Buzzluck. However if you are looking for one of the most informative and userfriendly casino sites out there then Buzzluck Casino is the place for you. I know that many sites in this day and age go for flash and other forms of multimedia but I for one actually like the approach that Buzzluck Casino have taken. The site is simple, clear and gets to the point and makes a nice change from all the other casino clone websites out there. 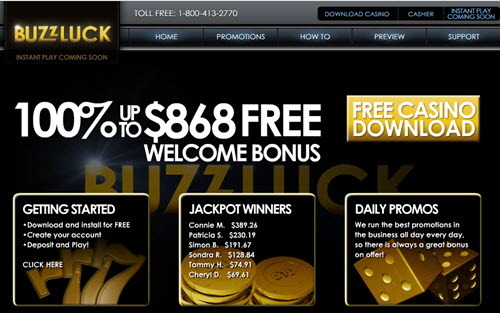 I like the games at Buzzluck Casino but then I have liked the RTG software from the beginning. When I first tested the games over a year ago I felt them to be very good but with room for improvement and to RTGs credit they have certainly improved. The video slots are a particular favorite and they have added more free spins and bonus games to most of them. I have also been informed that Buzzluck Casino will be releasing a number of new video slots in the near future. There are a good number of traditional casino games on offer as well as a section entitled ‘other games' which at the moment only included Keno but once again we are informed that more games will be added soon. How do the bonuses at Buzzluck Casino measure up to the rest of the casinos out there? Not to bad actually, at the time of writing this they are offering a very good 100% up to $868 on your first deposit and will also offer you 2 more bonuses on your next two deposits. This is usually the biggest issue with online casinos (including ones that have been around a while) and is one area that Buzzluck promised they would excel at. To test this we had 2 different people, register sign up and make a withdrawal at Buzzluck Casino. In our opinion support at Buzzluck is pretty darn good, we encountered no major problems and any questions that we had were answered prompty by friendly staff. One question needed to be referred to their Casino manager (David Webb) and he personally got back to us within a day. The live chat window in the interface is definitely a good addition as well as this they have toll free numbers for the US and UK. Email response is pretty swift to. So have Buzzluck delivered what they said they would and revolutionised the industry? I have to be honest here and say that they have not. Not yet anyway, but they have definitely taken some major steps to show they are serious about achieving their goal Support is very good, the games and interface are great and things are improving all the time. Lets face it it will take more than 1 year to affect change but I am pretty confident that in another year the answer to the above question will be yes and in the meantime I have no problem with recommending them to anyone.